Four of our Year 10 students (Frankie, Jamal, Aroon and Nyheam) have been fortunate enough to secure a work experience placement coaching for BCFC. We are delighted to have received the following feedback from Pete Sellwood of BCFC - “The four lads from Cotham have been excellent. They are knowledgeable and contribute well in discussion. They have worked well with the students from Sheldon School, Chippenham and they are a credit to Cotham School. We were all delighted when Nyheam came back to tell us he had won the prestigious 100 meters sprint in the Bristol Schools Athletics Championships yesterday evening. It has been a successful week in every way”. Congratulations and thanks to the boys for being such fantastic ambassadors for our school. Click here for images. A massive well done to Mr Vaughan, Mr Slane, Mr Cawse and Mr McGrath for allowing students to vent some frustration by pelting them with soggy sponges at lunchtime today. In 20 mins we raised £46.55 for WaterAid! Click here for images. Congratulations to the Year 8 boys Super 6 Athletics team who won the Bristol Schools Competition on Thursday. They have qualified to represent Bristol Schools at the Summer Schools Games at Bath University on the 5 July. Team: Kaylen Smith, Tiye Thomas-Smith, Alfie Luing, Lucas Down, Kyah Tunnicliffe and Ali Suliman. If you would like to tell us about any student achievements outside of school or to promote a community event etc via our weekly mailing please do not hesitate to contact us with details. Students will be registered as normal at 8.40am, and then escorted by tutors to the back of school to be transported by coach to South Gloucestershire and Stroud College in Filton from 8.45am onwards. At the end of the event, students will be returned to school by coach. It is difficult to give an exact finish time as this will depend on how smoothly the day runs, but we envisage students being dismissed from school between 2.45pm and 3.15pm. Cotham Co Fund is open! Students can apply for money of between £50 and £500 to set up a project that makes our school even better! The committee will make decisions by 21 July (last day of term). Therefore any bids to the Co Fund must now be for projects taking place in next academic year. A large number of schools and colleges have been affected, directly and indirectly, by the tragic events that took place at the Manchester Arena on the 22 May. The Education and Skills Funding Agency (ESFA) have been working with many through local authorities and the Regional Schools Commissioners and want to continue to ensure that all schools and colleges are aware of the wide range of support available from local authorities, health services and third sector providers, to help them in supporting their pupils, staff, and wider communities including families. Young people and staff may also have questions or may want to speak to someone following the most recent incident in London on the 3 June. The link below sets out the range of support services available – both to people in Manchester specifically and more widely across the country – and where they can be accessed, including information on mental health support, practical advice on issues such as disruption to public examinations, and resources to help discussions with young people about these issues. If you have any questions or concerns, please contact the ESFA directly via this form. Maths assessments will be commencing the week commencing Monday 19June. Students have been informed in class and issued with revision lists. Students will need to bring all the usual maths equipment including a calculator. Maths assessments will be commencing the week commencing Monday 26 June. The students’ will be reminded by their tutors, of the important examination rules. Click here to view. These strict guidelines are to help with the smooth running of the exam hall so that the students have the best possible environment in which to work. As an exam centre we must abide by the requirements of the exam boards. Please make sure your child is clear about the standards expected and the serious implications for their results if these rules are not adhered to. End of Year Exams will take place for the next two weeks (weeks commencing 19 and 26 June). A summary of the content being examined can be found found here. A copy of the timetable can be found here. Students should refer to their individual exam timetable which has been given to them this week. We regret that we have had to move the English Lan exam from Mon 26 June to Wed 21 June and the R.E.P exam from Wed 21 June to Mon 26 June. All students need to be in school to start morning exams at 8.30am. Students do not need to register with their tutor and instead will be registered in the exam hall. All students must be in full school uniform and have their school lanyard so that they can be identified by exam invigilators. The school takes no responsibility for mobile phones and other valuables left in students bags during exams. We want all students to use the mock exam experience so that they are more prepared for their formal GCSE exams next year. Please support us with this by encouraging your child to use their evenings revising content delivered to them during Year 10. All students are aware of what and how to revise. The majority of GCSEs are completed but they do continue into next week. Well done to Year 11 who have demonstrated maturity in their approach to their exams. We regret that the Graphics Exam Preparation Session on Tuesday 20 June has been cancelled due to staff absence. Students will be set additional revision tasks by google classroom. It would be great if parents/carers could let the school/PE department know of any students achievements outside of school please. It is sometimes only at subject evenings that we find out what students are doing outside of school! Email us: info@cotham.bristol.sch.uk. You are invited to this year’s summer celebration of all things musical at Cotham School. 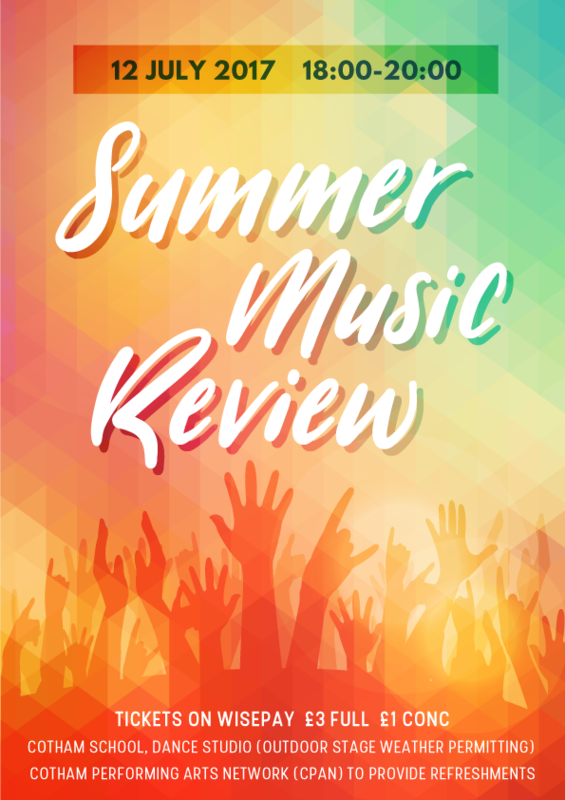 The 2017 Summer Music Review will take place on Wednesday 12 July 6-8pm in the Dance Studio. However, if the weather holds up we may even move outdoors! Click here to view poster. We are very proud of the range and variety of extracurricular activities that we offer at Cotham School, as well as the excellent standard of the performance opportunities we provide for your children to showcase their skills and talents. One of the things that makes these evenings so special is the support of Cotham Performing Arts Network (CPAN), our parent support group for the Performing Arts. All parents and carers are welcome to join us. It is a great way to meet other parents and get to know the staff. CPAN volunteers mainly help out by serving refreshments at Performing Arts events throughout the year. Provision of refreshments at events has been a significant fundraiser for Performing Arts and has added greatly to performance evenings, making them so much more sociable and enjoyable for the audiences. We are now looking to enlist the support of parents who are willing to help out at future events and performances. If you would like to get involved with CPAN and its activities, please get in touch by email to: CPAN@cotham.bristol.sch.uk. To register to audition please email your name and tutor group to pulse@cotham.bristol.sch.uk. Congratulations to Ella Bragonier 10AEL who is awarded Drama work of the week for her set design for the play, The Government Inspector. Well done! Click here to view. Bristol City Council are looking for cycle instructors to join their team of cycle instructors delivering Bikeability cycle training, promoting cycling and providing inclusive cycling activities throughout the city. Ideally you’ll be an experienced national standards qualified instructor but training will be provided for keen cyclists with the right skills and experience.